The Postles (From Left): Jack Jr., Jack, Pat, Linda, Jeffrey, Helen, Wendell, Herb, Margaret, Harry, Katherine and Beth. "To have a university and a dental school that does so much for the community – and our family is part of that? It's a great honor," said Herb Postle, '86 DDS, a fourth- generation Ohio State graduate and third-generation College of Dentistry graduate. 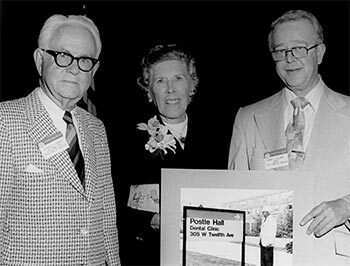 The Postle family has played an integral role in the college's 125-year history. Like the school that carries their name, the Postle family story is filled with learning, challenge, accomplishment, and service to community. Harry Herbert Postle, MD, began the family affiliation with Ohio State's health sciences before the medical college was actually a part of The Ohio State University. The school was founded as the Ohio Medical University in 1890 and included a department of dentistry. It later became the Starling Medical School, from which "Dr. Harry," as he was known, graduated with his M.D. in 1898. "I can't imagine what it was like back then," laughed Jack Postle, '53 MD, '60 MS, Dr. Harry's grandson and Herb's uncle. "He really was a horse-and-buggy doctor, and did a little dental work too. That probably amounted to pulling teeth and not much else." Dr. Harry lived and practiced in Toboso, Ohio, a small town east of Newark. He later saw patients at an office in Newark. Dr. Harry kept ledgers of all his patients, services, and charges. One of the ledgers was passed on to Jack, who donated it to a medical museum. Dr. Harry's only child, Wendell Dean, was born at home in Toboso and grew up in Newark. In fact, his childhood home was just across the street from that of his future wife, Helen Rossel. Wendell followed his father to Ohio State, and in 1923 became the first member of the Postle family to attend and graduate from the College of Dentistry. He loved his alma mater and remained an active part of the Ohio State community throughout his life. 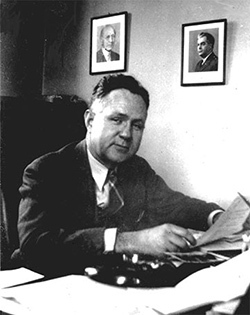 After serving the college as an instructor, Wendell was named dean of the College of Dentistry in 1939. At just 39, he was the school's youngest dean, and served for 25 years. His naturally charismatic nature and love for Ohio State had a huge impact on the students whose paths crossed his. "Oh, every time I go to a reunion, I am approached by people who all start with, 'If it wasn't for your dad …'" said Jack. "He helped so many students get through school. He really was beloved." In addition to his duties as dean, Wendell—who was passionate about football—was appointed as Ohio State's representative to the Big 10 athletic conference in 1947. He was among the group who hired Woody Hayes in 1951 and they went on to become life-long friends. During his tenure as dean, Wendell initiated the college's enduring Post College Assembly, and conceived of the plan to include a program in dental hygiene for the college. Also, he collaborated with then-Ohio State Medical School Dean Charles A. Doan on the construction of the new hospital and dental school buildings in 1950. "He had to deal with the state legislature and other politicians," Jack said. "It turned out to be one of his greatest successes." Those buildings now carry the two men's names: University Hospital was renamed Doan Hall in 1983 and the dentistry building was named Postle Hall in 1976. "Initiating big changes at the college, ["Wendell's] name was synonymous with dentistry at the university. He was like the infrastructure of the building we called home for at least four years of our dental education. He was, after all, the gray-haired father to all of us." Wendell was an avid proponent of dental education, even to those who didn't realize they wanted it. "Many of those people who tell me how influential Granddad was in their dental careers say something like, 'I had no intention of becoming a dentist, until I met your granddad.' He was good at picking out people who would be good at dentistry. Really, he was a recruiter for the dental school." Many years after Wendell retired, Louis P. DiOrio, '64 DDS, eloquently summarized Dean Postle's place in College of Dentistry history when he wrote in the college's history book, A Historical Remembrance of The Ohio State University College of Dentistry, "Initiating big changes at the college, ["Wendell's] name was synonymous with dentistry at the university. He was like the infrastructure of the building we called home for at least four years of our dental education. He was, after all, the gray-haired father to all of us." During his tenure at the College of Dentistry, Wendell and his wife, Helen, had three sons: Dean, Harry Herbert II, and Jack. Harry married his high school sweetheart, Margaret Bennett, another Ohio State alum, and taught and practiced dentistry throughout his life. "My father was very happy being a great dentist," Harry's son, Harry Herbert Postle III, said. "He never wanted the spotlight that Granddad had. He was happy that Granddad loved that, but he really focused on his work, and he was an excellent dentist." Wendell and Harry practiced together for more than 30 years, at two different office locations near campus. The proximity to campus was a given. Both taught there, and Wendell continued his connection to the school after retirement. "I'm sure he freely offered suggestions to the new dean," laughed Herb. In fact, while Herb himself was a student at the college, Wendell called and asked if he was interested in knowing what his course grades were. Herb declined. Jack, Wendell's son and Harry's brother, also attended Ohio State. Rather than dentistry like his father, though, he chose a path more similar to his grandfather's: medicine. "And I did, straight through: pre-med, medical college, internship, residency, all at Ohio State." But then Jack's story took a turn—north. "Much to the regret of my father, I chose to practice in Northern Michigan," Jack laughed. "He called me 'the one that got away." Jack practiced as an OB/GYN in Petoskey, Michigan, where he lived with his wife, Patricia Kemerer, and their three children. Before Pat passed away in 2011, she and Jack researched a comprehensive history of the Postle family, which Jack wrote and shared with the family. "We had a delightful time going from place to place together," he said, "gathering information, taking pictures, and meeting people." As a child, Harry Herbert Postle III (Herb) enjoyed going to the office with his father (Harry) and grandfather (Wendell)—, especially on the Sundays when they saw a special patient: Woody Hayes. "That was the only day Woody took off, so that's when he came in," Herb said. Once, Woody brought a gift for young Herb: a game ball from the 1968 national championship, signed by all the players. "So I did what an eight-year-old boy does," Herb laughed. "I took it outside and played football with it." "Granddad would do anything to make sure students got a great education, and now all four of them are doing just that, for years to come." Herb was just 16 when the dentistry building was renamed Wendell D. Postle Hall. "It was a great honor, and granddad was still living when that happened in 1976," Herb said. "It was a huge moment for our entire family, a proud moment." Herb was the first Postle to attend the college after the building was named Postle Hall. "I loved every single second of it," he said. He taught at the school for several years, and joined Harry in the family practice. "It was a real gift to be able to practice with my dad," he said. The two practiced together for many years before Harry's retirement, and Herb continues in private practice today. As Jack and Herb have heard time and time again, Wendell had an enduring effect on many students of the university and the college. He encouraged them, supported their ambitions, and even taught them. In time, he and Helen established the Wendell D. and Helen R. Postle Scholarship Fund to help even more students get a dental education. In turn, Harry and Margaret established the Harry H. and Margaret B. Postle Scholarship Fund. "Granddad would do anything to make sure students got a great education," Herb said. "And now all four of them are doing just that, for years to come." Numerous students have benefited from the generosity of the Postle family, including their continuing financial support of these two scholarship funds.Truly, an enduring testament to a family's commitment; a legacy of service, excellence, and caring.